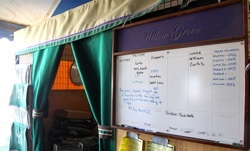 Stable boards are available in wood or vinyl. It seems like everyone likes a different layout for their stable boards. We offer plain, plain with cork, a variety of lined options, and completely custom boards. It is your choice and we can help you lay out the perfect board for you. 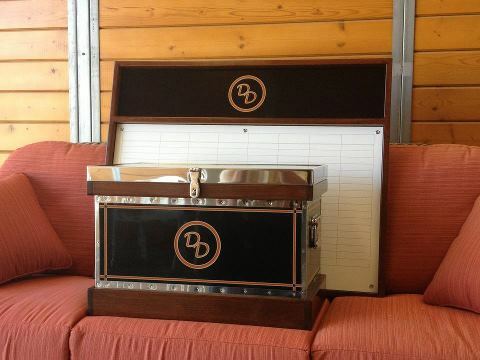 We even offer a board that is completely cork that opens like a shadow box for ribbons - Scott Stewart's favorite! Plain boards are available with the entire surface being white board or 2/3 of the surface being whiteboard and 1/3 being cork. Your choice. Boards are personal. Different people prefer different layouts and it is rare for us to repeat a layout. If you want to talk about a custom board - give us a call, we'll walk you through the process. 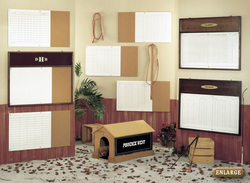 We offer several standard boards. They are available with a variety of rows and columns, with or without cork, and some with pre carved labels on the columns. Some barns need big boards! We get that and we are happy to accommodate your custom sized boards. Just keep in mind, oversized boards must ship freight instead of ground, so combine the order with a trunk order to save the most money.